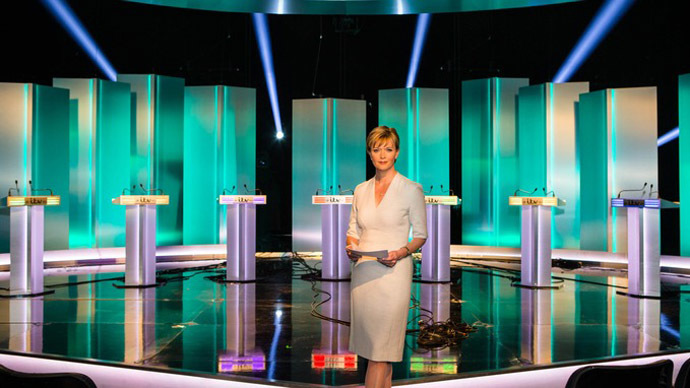 ITV has announced the format of Thursday evening’s election debate, which will feature the leaders of Britain’s seven major parties: the Conservatives, Labour, the Liberal Democrats, the Green Party, the Scottish National Party and Plaid Cymru. The debate will be broadcast live from 8pm to 10pm on ITV and chaired by news anchor Julie Etchingham, who will moderate the debate and ensure all parties are allowed to speak. The leaders have drawn lots for which podium they will occupy. They will appear on screen from left to right: Natalie Bennett, Nick Clegg, Nigel Farage, Ed Miliband, Leanne Wood, Nicola Sturgeon and David Cameron. The debates have been a source of conflict for the parties both in and outside Westminster, with David Cameron refusing to take part in any but a seven-party debate. The prime minister was accused of “running chicken” from the live broadcasts amid speculation he feared the debates may cost him votes. The debate will be structured around four substantial questions. After each question, each leader will be given a minute to speak on the subject before it is opened up to discussion. Leaders have already drawn ballots for the order of speaker after each question. Natalie Bennett will open the debate and David Cameron will close it. The debate will take place at Media City in Salford, Northern England, where an audience of 200 people has been specially selected. ITV say the studio audience demographically represents the UK. David Cameron is broadly considered to have ‘won’ the Battle for Number 10 discussion last week on Channel 4, though viewers were more sympathetic to Ed Miliband after critics suggested the show’s hosts were too harsh on the Labour leader. Cameron’s aides believe he is capable of winning regardless of Labour and Scottish National Party (SNP) performances. If the two parties are shown to be in agreement, Cameron can warn against a post-election Labour/SNP coalition, while if they are shown to disagree he can alert against the dangers of a hung-parliament. Aides have said he will take a “show-not-tell” approach to undermining the other parties. Deputy Prime Minister Nick Clegg performed admirably in the 2010 televised election debates against former Labour Prime Minister Gordon Brown and David Cameron. His performance is credited with hugely increasing support for the Lib Dems. He is expected to focus on the inevitability of a hung parliament, and urge viewers not to consider one outright leader, but to think about which parties might occupy Westminster in the event there is no majority party. His support is waning, however, and critics say the other parties don’t consider him a threat. According to a poll released on Wednesday, Clegg may even lose his seat in parliament to a Labour Party rival. Ed Miliband faces a tough night with the nationalist parties and the Greens on the left, UKIP on the right and David Cameron attempting to manipulate any talk of a Labour/SNP agreement. Critics have said he needs to avoid solely addressing Cameron, as that would display politics as the “old boys club” Green Party leader Natalie Bennett has previously stated, handing smaller parties fodder to appear as the everyman’s party. Natalie Bennett’s party has been at the forefront of discussions surrounding the debates after a petition demanding their appearance in the broadcast received over 200,000 signatures. Following her “train-crash” interview with LBC radio, however, Bennett needs to show she has a full grasp of her party’s policies. A Green Party spokesman predicted the debate would show “business-as-usual politics has had its day,” saying Bennett was excited about sharing the Green Party’s values. Bookies are placing odds on the right-wing, anti-immigration party winning Thursday’s debate. Placing himself with Natalie Bennett as an ‘outsider’ will give UKIP leader Nigel Farage the opportunity to contrast himself with the traditional establishment. Commentators say the best way for Farage to succeed would be to claim the main parties are now talking about immigration because UKIP forced them to. Nicola Sturgeon was described as “formidable” in debates by the Guardian, which thinks she will be a force to be reckoned with. The Scottish National Party was catapulted to the forefront of Westminster debates during last September’s independence referendum. Sturgeon’s main strength is that she is appealing to one particular demographic and has the capacity to build a strong vision for Scottish voters, without becoming embroiled in the Westminster henhouse. The Welsh nationalist party is the evident underdog, with leader Leanne Wood receiving far less press attention than the other six leaders. Professor Michael Beverland wrote in the MailOnline that one reason Wood’s party might suffer during the debate is that they are not radically different from Labour. He argues that in order for Wood to succeed, she must follow in Sturgeon’s footsteps and set out a coherent vision for Wales.